David Green provides an overview of black marlin and methods to catch this lively gamefish. BLACK marlin (Istiompax indica) are the most widely distributed billfish in Australian waters. From the South Coast of NSW, up along the Queensland coast, across the Top End and south down the West Australian coastline, there are reasonable concentrations of blacks throughout the warmer months. Unlike blue marlin, black marlin are found on inshore grounds as well as on the continental shelf. Breeding populations of large adult fish congregate on the reef edges of the northern part of the Great Barrier Reef in spring. 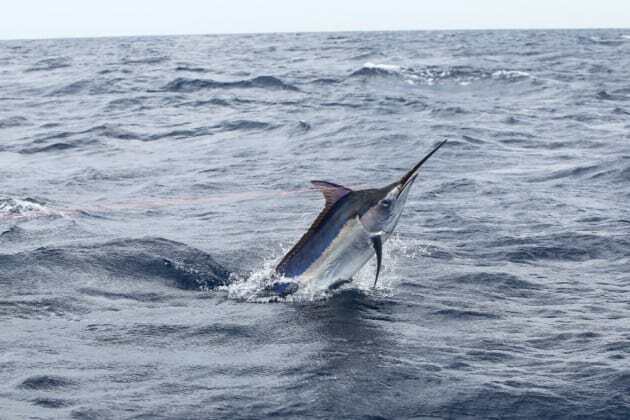 This has led to the famous black marlin fishery based out of Cairns and Lizard Island where more “granders” (fish over 1000 pounds) are caught each season than in any other part of the world. The annual spawning run of adult fish in North Queensland produces a massive tide of tiny juvenile black marlin. The often strong south-easterly trade winds push this tide of eggs and fry inside the many reef passages in the Great Barrier Reef where the juveniles rapidly grow inside the reef edge, gorging on a tide of plankton and bait in the fertile shallow waters. These fish grow extremely rapidly and in about eight months reach a size of 6-10 kilos. Concentrations of these baby black marlin start to appear on grounds like Cape Bowling Green off Townsville in the winter, and there are also populations of small blacks, sometimes as little as four kilos, that show up in northern WA around Broome. While there’s a reasonable understanding of black marlin migration on the east coast, it seems likely that there are probably many other spawning aggregations in the west that we as yet don’t fully understand. When the East Australian Current starts to move south in spring it takes vast numbers of these small and hungry marlin with it, rapidly growing as they feed on big shoals of pilchards and slimy mackerel. These fish arrive in Central Queensland in spring. At times large groups of fish move inside the top edge of Fraser Island in October and November which gives rise to great inshore fishing on the flats and some fantastic fly fishing. The run of fish hits the Gold Coast in late November through to January on the inshore grounds, and these same fish usually arrive at ports like South West Rocks, Port Stephens and Sydney a month or two later. The number of fish varies greatly from season to season. It all depends on what happened on the spawning grounds the previous spring. If the spawning season went well and the winds blew hard in North Queensland, there’s usually a good stock of juvenile marlin. The black marlin fishery can be a feast or famine scenario, but in general there are enough fish to keep anglers keen. In the boom years getting more than 10 strikes per day is quite common. The smaller black marlin tend to run on the inshore areas in depths between 20 and 80m. At times I’ve caught them just out the back of the surf break off my home waters on Queensland’s Gold Coast, but I’ve also caught 20 kilo black marlin well wide of the continental shelf. While the juveniles move on the inshore grounds there is an accompanying run of two to four-year-old fish in areas between 60 and 100m. These appear on most east coast grounds in summer. Generally speaking, most fish range between 40 and 100 kilos. Black marlin are a spectacular gamefish. While the initial take off and run may lack the speed and crazy antics of a big blue marlin, a black will fight long and hard. While you can wear a blue marlin down in time, black marlin seem to have remarkable endurance. On light tackle they are never easy to land. The following is an overview of the tactics I have found to be successful when targeting black marlin off the Gold Coast. Most of my fishing is done from a 6m trailer boat with two or three anglers on board. We tend to concentrate on the small inshore fish in early summer using eight and 10 kilo tackle before heading out wider in February and March where we target the bigger fish on 15 and 24 kilo gear. Running a teaser definitely seems to draw more bites, especially when targeting aggressive juvenile marlin. Using lures for black marlin on the inshore grounds is simple and fun and the bites are usually spectacular. The main advantages of lure trolling are that you cover a lot of ground in a day. Also, it’s a good method to catch tasty bycatch such as dolphin fish and wahoo. The disadvantages of lure trolling is that it has the poorest hook-up rate of any method. In general, you’ll need three strikes to get two hook-ups and one landed fish. There are a few ways to improve these odds but it’s not easy to drive a hook into the hard bony jaws of a black marlin. A lot of fish will strike, run and then throw the lure on the first jump. Despite this, it’s a fun way to fish and the fight on a lure-caught fish is often a lot more exciting than happens when a marlin takes a deep live bait. I troll a spread of five lures and I vary the size and colour on all of my offerings. I am also a big believer in trolling a mirrored teaser like the famous Pakula Witch Doctor when targeting black marlin on lures. Over many seasons I’ve noticed that the lure closest to the teaser draws a disproportional number of strikes. Lure size is generally between 15 and 25cm. My favourite lure brands for black marlin are Black Snacks, (made locally on the Gold Coast by Mitchell Calcutt), Meridians and small Pakulas. Sometimes a really tiny lure like the Pakula Uzi gets a lot of bites when fish are on small bait. Good colours include lumo green, purple over pink, blue, gold and silver and plain white. Different lure head shapes work in different conditions. In calm conditions longer heads are often effective and stay true and straight; in rougher conditions you may need something with a more cup shaped face, such as the Black Snacks Hot Head. This lure leaves one of the biggest bubble trails I’ve ever seen. I rig all of my light tackle lures using 10/0 Gamakatsu saltwater fly hooks, using a pair of hooks on the larger lures and single hooks on the smaller ones. The second hook is mounted on a short length of 49 strand cable which gives some protection from wahoo and mackerel teeth. I use these hooks on tackle up to 10 kilos and also put a small zinc corrosion anode on the hook shaft. Lure positioning is important. The “shotgun” is mounted high and runs from the rocket launcher in my boat. This lure is positioned between 60 and 80m behind the boat. I like something small and straight running in this position. From the outriggers I run two medium sized lures in different colours at around 30 to 50m back. The two short flat lines carry bigger, darker lures that are easier to see in the prop wash and are positioned 10 to 20m behind the boat. More often than not, it’s the shortest lure that gets the most marlin bites. I run my lures on quite a light drag setting so the fish can turn and run with the lure. I find this gives a much better hook up. When lure trolling I run an average speed of about seven knots when chasing black marlin. I concentrate on known spots where bait holds, and much prefer trolling over reef than over sand. Look for birds, bait, temperature breaks and warm water. In general, a water temperature of 24.5 to 27 degrees is the best temp zone for black marlin. If you find a likely area or you have had a strike and missed, stay in the vicinity. Don’t just randomly wander. Lure trolling is a waiting game; it’s all about using the subtle clues to your advantage. If you find good concentrations of bait, you’re in the right spot. This slightly more complex method combines the ground coverage of lure trolling with the hook-up rate of bait fishing. I like to troll two rods with hookless lures and a belly strip sewn under the skirts. Plus I run a Witch Doctor and a bird teaser out the back. The bird teaser flaps on the surface and has a daisy chain of squids and skirted lures running behind it. When a marlin is raised it will often come in on the bird teaser, then chew on the hookless lure (the belly strip sewn into the skirt of the lure makes them hold on to it better). At this time we cast a live rigged slimy or a rigged dead garfish to the billfish which generally swims over and takes the bait. This is a standard trolling method for sailfish as well as black marlin. It is a very visual method and quite exciting. Casting a bait to a lit-up marlin is something you don’t forget in a hurry. The disadvantages of troll & switch is that it requires constant attention and getting a good “tease” takes a bit of practice. It can also be a very frustrating method when the wahoo are thick and absolutely destroy your hookless lures. Ideally, you need a crew of three to do it well: an angler, someone working the teasers and a boat driver. It’s a challenging method when you have inexperienced crew. While I use hookless lures with belly strips of tuna or dolphin fish sewn into them, rigged hookless baits such as slimies, bonito or queenfish are also very good. Small queenfish make great teaser baits as they are very tough and last numerous “chewings”. This method has been traditionally used for many decades in Queensland ports. 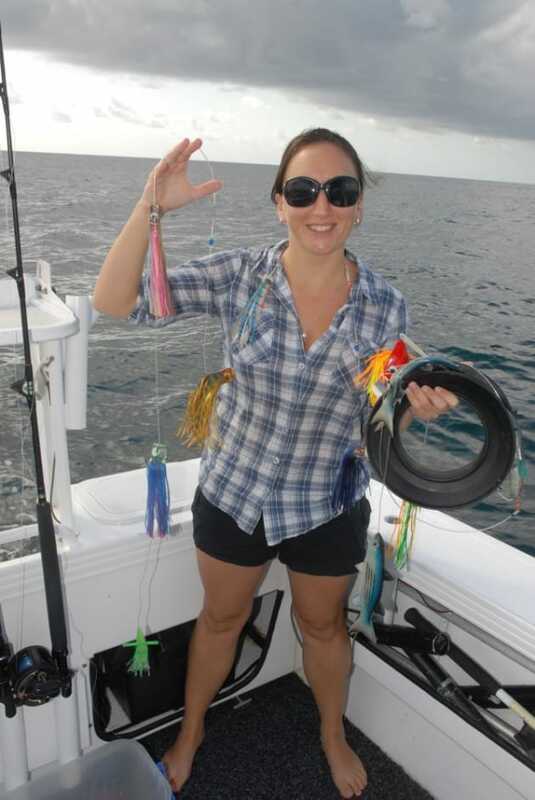 A combination of swimming and skipping gars and a spit tail mullet carefully rigged and trolled at around 5 knots is a great way to target both small black marlin and sailfish. Bait rigging has become a bit of a lost art in many places. Rigged on small circle hooks, the swimming or skipping gar is trolled from the outriggers and the mullet runs from the flat lines or downriggers. The release clips are set at a light pressure, and when a billfish takes the bait it is let run, the boat slows or stops and then the angler pushes the drag to strike and waits for the circle hook to lock in. Dead bait trolling is a very effective method but requires a high degree of skill and preparation time. Getting good quality garfish can also be difficult. That said, this method is a great way to fish with a very high percentage rate of strikes to hook ups. Drifting a live bait through a big bait school is probably the most effective but least spectacular method of catching a marlin. At times, however, when fish are deep, a live bait is the only way to get a hookup. I fish two rods, one with a small lead and one with a bigger sinker to get down deeper. I like to have the leads so they are well away from the bait and preferably so they break away on strike. I use Eagle Claw laser sharp circle hooks. If there’s a massive school of bait, you will generally see marlin marking on your sounder. Using a controlled drift or slow troll, it isn’t too hard to get your bait in the zone. Sometimes when large schools of slimy mackerel are holding in one spot, many marlin will be caught in that area. At times this attracts a ridiculous number of boats. If you like crowds, fights, abuse and having your lines run over, then this type of fishing is for you. While I do spend a bit of time live baiting for marlin, I much prefer to find my own bait school and have plenty of room to fight my fish. It’s a very effective method and I much prefer to slow troll my baits rather than drift with a massive lead. Now is black marlin time all along the inshore grounds of the east coast. They are a great fish, providing spectacular action for all anglers with a suitable trailer boat.